Ignite Technology and Innovation is 501(c)(3) not for profit company that develops Technology spaces in underserved communities. We create a co-working and shared office environment that fuses community based organizations, businesses, Tech companies and people in one space. The spaces are unique because it offers affordable professional and highly technological space to folks who normally would not have the opportunity. 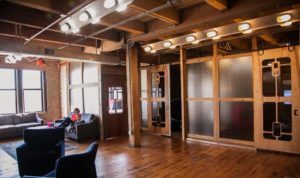 A prototypical space consist of an open co working space, a small event space , shared offices, conference rooms , classrooms a maker space and a community kitchen.